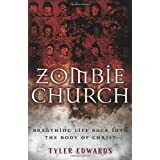 Zombie Church: Breathing Life Back into the Body of Christ ReviewI chose to review Zombie Church mainly out of curiosity. I wasn't familiar with the author, Tyler Edwards (the lead minister of Cornerstone Christian Church in Joplin, Missouri). I was somewhat skeptical about the premise of the book. This could either be done very well, or just be lame. I think that God is bored with the petty faith of our American churches. When is the last time we did something that would require God to act? When is the last time our churches stepped out in faith to do something so big, we would need God to be a part of it? I'm not saying we haven't done anything. We have accomplished some great things, but for a nation of "Christian" people and two hundred years of working at it, you would think we would have accomplished a lot more (page 151). Zombie Church is convicting, and relevant, and good. It was also very interesting. The whole zombie angle was done well, and I can think of several friends that would be interested in this book for that fact alone. Edwards took truths and concepts that are widely known in some religious circles, and expanded them to include and engage a whole new subculture. Disclaimer: I received a complementary copy of this book from Kregel Publications as part of a Litfuse blog tour. No other compensation was received. Want to learn more information about Zombie Church: Breathing Life Back into the Body of Christ?